[S1893] 1930 US Federal Census, Mansfield, Tolland County, Connecticut, digital image Ancestry.com ; National Archives micropublication, Robert B Gardiner head of household, roll 284, enumeration district 8, page 8A. [S1883] Gary, family tree titled "Nilson Family Tree", published by Ancestry.com, wc.rootsweb.ancestry.com, from database named gnilson, updated Apr 2011, viewed May 2011. [S1884] 1910 US Federal Census, Mansfield, Tolland County, Connecticut, digital image Ancestry.com ; National Archives micropublication, Edward Warren head of household, roll T624_143, enumeration district 0557, page 16B. [S4013] Find A Grave: Storrs Cemetery (New), Storrs, Connecticut, Edward Warren, created by Anonymous88, added Jan 2011, memorial number 63793972. [S1883] Gary, family tree titled "Nilson Family Tree", published by Ancestry.com, wc.rootsweb.ancestry.com, from database named gnilson, updated Apr 2011, viewed May 2011 , place=Storrs CT.
[S1919] 1920 US Federal Census, Mansfield, Tolland County, Connecticut, digital image Ancestry.com ; National Archives micropublication, Edward Warren head of household, roll T265_198, enumeration district 313, page 15A. [S4766] 1940 US Federal Census, Mansfield, Tolland County, Connecticut, digital image ; National Archives micropublication, Carl L Warren head of household, roll T627_527, enumeration district 7-10, page 4A. [S1898] 1930 US Federal Census, New Britain, Hartford County, Connecticut, digital image Ancestry.com ; National Archives micropublication, Augusta Anderson head of household, roll 267, enumeration district 180, page 15B. [S3557] Find A Grave: marion Center Memorial Cemetery, Marion Center, Pennsylvania, Carl Lloyd Warren created by Anonymous88, added Jan 2011, memorial number 63809416. 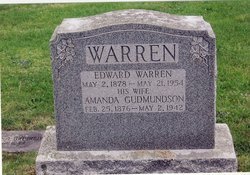 [S4013] Find A Grave: Storrs Cemetery (New), Storrs, Connecticut, Raymond Goodman Warren, created by Anonymous88, added Jan 2011, memorial number 63877123. [S4766] 1940 US Federal Census, Mansfield, Tolland County, Connecticut, digital image ; National Archives micropublication, Raymond G Warren head of household, roll T627_527, enumeration district 7-10, page 4A. [S1879] 1930 US Federal Census, Hartford, Hartford County, Connecticut, digital image Ancestry.com ; National Archives micropublication, Raymond Warren head of household, roll 264, enumeration district 51, page 51B. 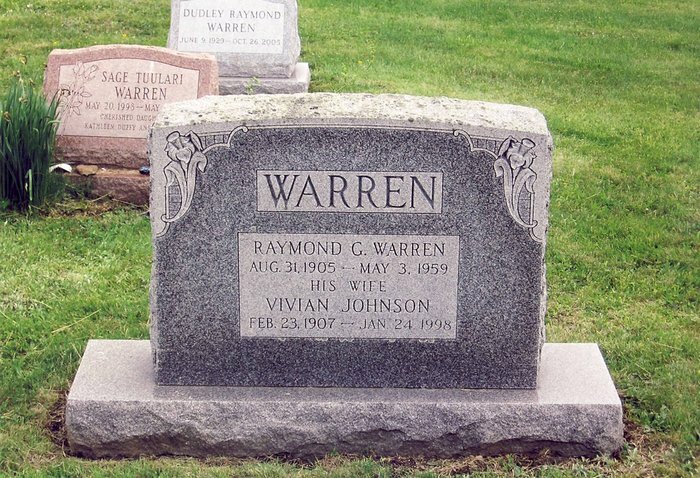 [S4013] Find A Grave: Storrs Cemetery (New), Storrs, Connecticut, Vivian Johnson Warren, created by Anonymous88, added Jan 2011, memorial number 63877246. 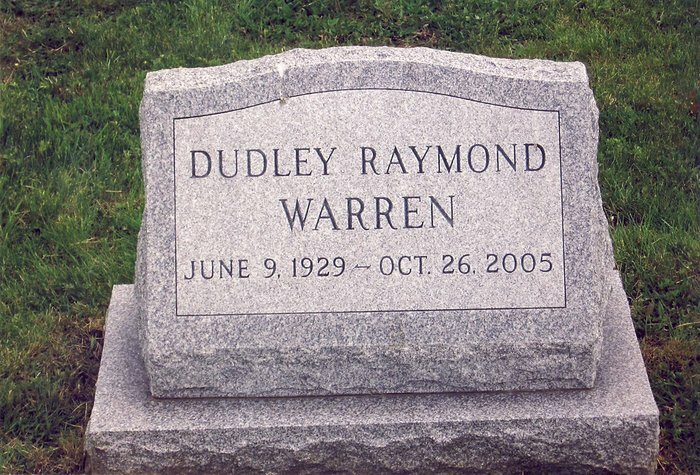 [S4013] Find A Grave: Storrs Cemetery (New), Storrs, Connecticut, Dudley Raymond Warren, created by Anonymous88, added Jan 2011, memorial number 63877334. [S4013] Find A Grave: Storrs Cemetery (New), Storrs, Connecticut, Dudley R Warren Jr, created by Anonymous88, added Jan 2016, memorial number 157244521. [S4013] Find A Grave: Storrs Cemetery (New), Storrs, Connecticut. [S4013] Find A Grave: Storrs Cemetery (New), Storrs, Connecticut, Margaret Manghild Anderson Warren, created by Anonymous88, added Jan 2011, memorial number 63789439. [S1898] 1930 US Federal Census, New Britain, Hartford County, Connecticut, digital image Ancestry.com ; National Archives micropublication, Augusta Anderson head of household, roll 267, enumeration district 180, page 15B . for parents birth country. [S4013] Find A Grave: Storrs Cemetery (New), Storrs, Connecticut, Wayne C Warren, created by Anonymous88, added Jan 2011, memorial number 63789545. 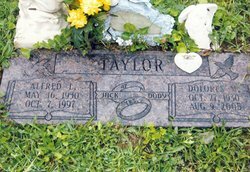 [S3350] Find A Grave: Coral Lutheran Cemetery, Indiana, Pennsylvania, Dolores Margaret Warren Taylor, created by Anonymous88, added Jan 2011, memorial number 64113432. 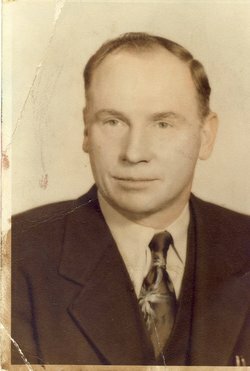 [S3350] Find A Grave: Coral Lutheran Cemetery, Indiana, Pennsylvania, Alfred Lloyd Taylor, created by Anonymous88, added Jan 2011, memorial number 64113297. [S172] Facebook, social networking site, www.facebook.com, Shirley Warren McGonnell, viewed May 2011. [S172] Facebook, social networking site, www.facebook.com, Joy McGonnell Clontz, viewed May 2011. [S1469] Veromi, a current name and address on-line database, www.veromi.net, viewed May 2011.